These Chocolate Chip Banana Bars are SO easy to make and have just 4 ingredients. They’re great for using up overripe bananas! Add some chocolate and you have a delicious banana dessert recipe. When I realized this recipe would work I was SO excited because it’s just so genius! Last weekend Mel and I decided to rent The Post (that movie with Tom Hanks and Meryl Streep). We were so excited to watch it; we’d wanted to see it in the theatre but didn’t get to before it left the theaters. We never rent movies because we can barely stay awake long enough to watch TV shows, so it was kind of a big deal for us. Guys, I hated it. We turned it off after an hour. It was sooooo boring. Was it just us? I had such high hopes, especially because I love Spielberg movies and Tom Hanks. We just couldn’t get into it…it was so slow and completely not the magical movie night I though it would be…so we turned it off and started Friday Night Lights over from episode 1. Something that is magical is this recipe for Chocolate Chip Banana Bars. When I realized that it was something that would work I was SHOCKED. I had no idea that by adding overripe bananas to Pillsbury cookie dough you could get a banana bar that’s a cross between a blondie and a cake. That’s just TWO ingredients for easy banana bars! I always have overripe bananas on my counter and in my freezer. I’m constantly making banana muffins and banana bread but when I made these I happened to have a roll of cookie dough that had to get used. I’d read somewhere that you can mix the two and get a delicious banana dessert but I didn’t believe it until I tried it. The result was a fluffy cookie cake bar that’s perfectly sweet and super full of banana flavor. These are like a frosted banana bar but with chocolate chips instead of a cream cheese frosting. They’re perfect without anything on top, but I added a chocolate glaze because…why not? Everything is better with more chocolate and more frosting, especially when it’s chocolate and banana. Although, I can totally see these with a cream cheese frosting or a peanut butter frosting…or my favorite chocolate brown butter frosting! Banana Cookie bars are the perfect way to use up overripe bananas and have a yummy treat all at the same time! Easy Chocolate Chip Banana Bars have only 4 ingredients and are a delicious banana cookie bar made with chocolate chips and chocolate frosting! You only need two main ingredients to make these easy banana bars: cookie dough and bananas. Then you can leave them plain or add your favorite stuff, like chocolate chips. I love the combination of banana and chocolate! Start with a prepared cookie dough. I like Pillsbury and I used sugar cookie dough but you can also use chocolate chip cookie dough (or any prepared dough; peanut butter cookie dough would be fabulous). Want to make a from scratch dough? Use my perfect sugar cookie bar recipe. You can skip the topping and make this a 3 ingredient recipe, but I love adding a chocolate ganache frosting. Just heat whipping cream and chocolate and pour it over the bars. Don’t forget you can freeze overripe bananas. Just let them thaw before making these banana bars. 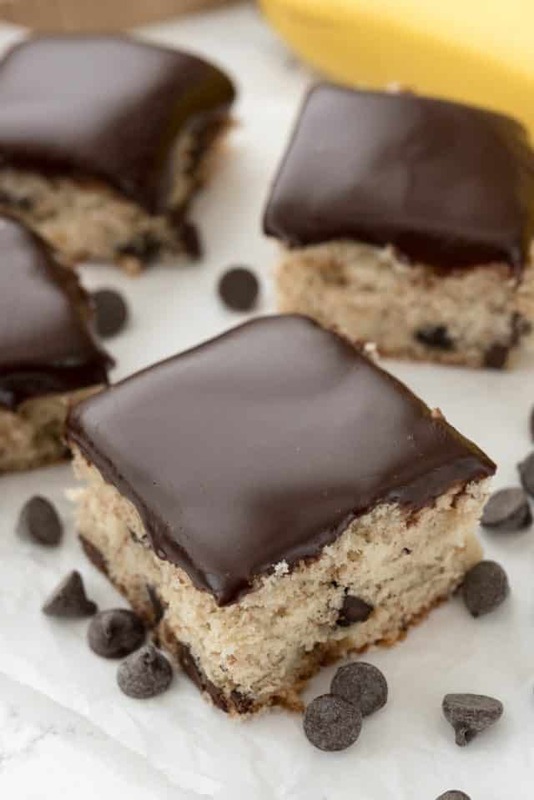 These Chocolate Chip Banana Bars are SO easy to make and have just 4 ingredients. They're great for using up overripe bananas! Add some chocolate and you have a delicious banana dessert recipe. Preheat oven to 350°F. Line a 9x13” baking pan with foil or parchment paper and spray with nonstick cooking spray. Gather your ingredients. Place bananas and sugar cookie dough in the bowl of a stand mixer fitted with the paddle attachment. You can also use a hand mixer or just use a wooden spoon. Beat cookie dough and bananas until smooth. Stir in 1 1/2 cups chocolate chips. Press into prepared pan. Bake for 35-40 minutes until a toothpick comes out clean. Place remaining 2 cups chocolate chips and heavy whipping cream in a microwave safe bowl or measuring cup. Heat for 1 minute on high power, then whisk until smooth. Pour over cooled bars, then chill to set frosting. Do you love using overripe bananas? I’ve got a huge list of ideas for you. Plus, I need to try these Blueberry Banana Bars, this Frosted Banana Cake, or the Snickerdoodle Banana Bars! 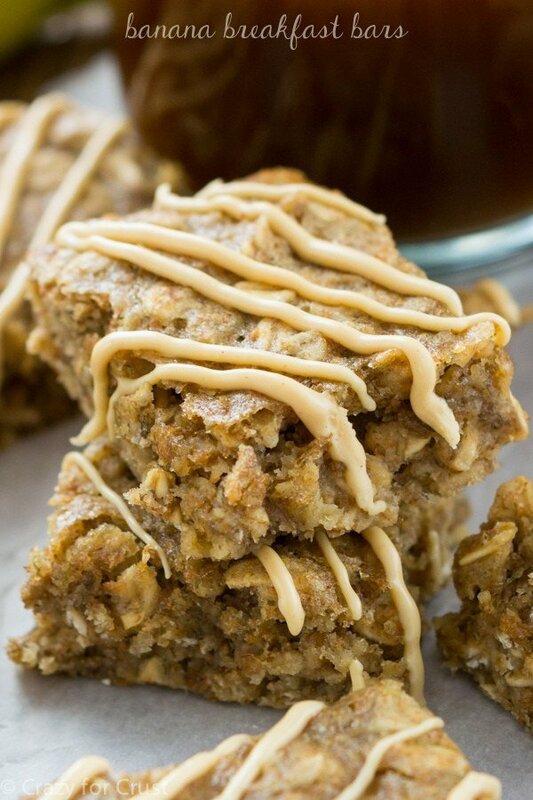 Banana Breakfast Bars are perfect for breakfast! 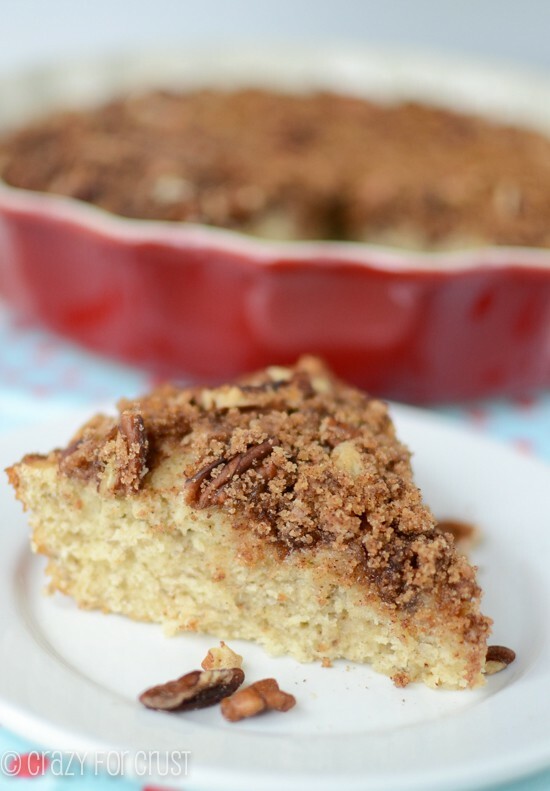 Banana Coffee cake is perfect for a lazy Sunday! 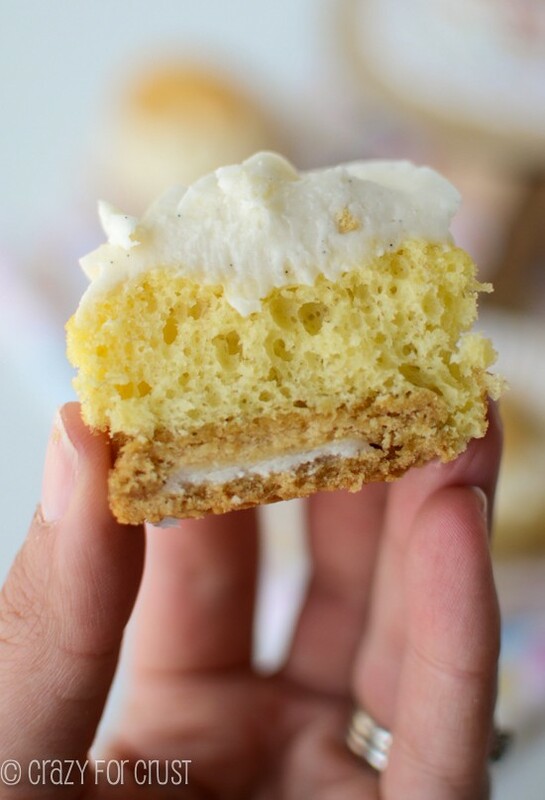 Banana Cupcakes are the best with Golden Oreos! 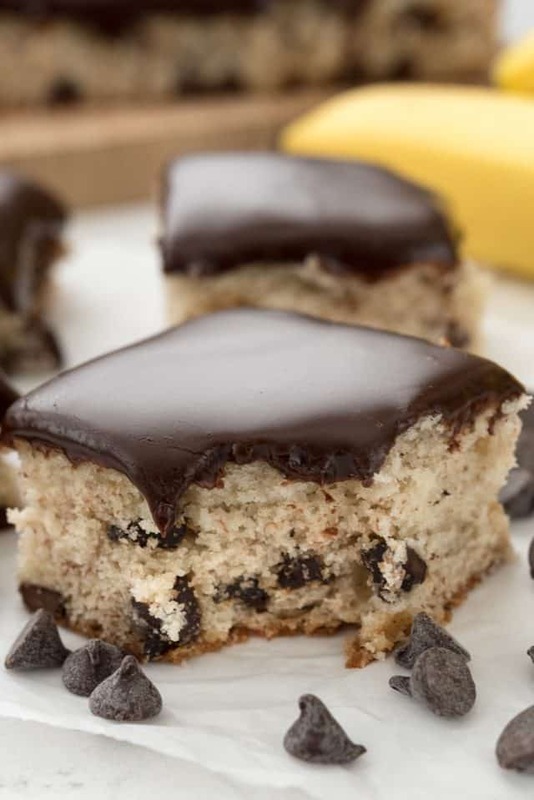 That ganache on top, with the banana flavor, combination made in heaven! Yum! I’ve pinned this recipe for later. These look so good! Wow. Miracle of baking chemistry, right there. Love these guys! I LOVE Chocolate Chip + Banana and I can’t believe these bars are only 4 ingredients?!!!! LOVE these!!!! 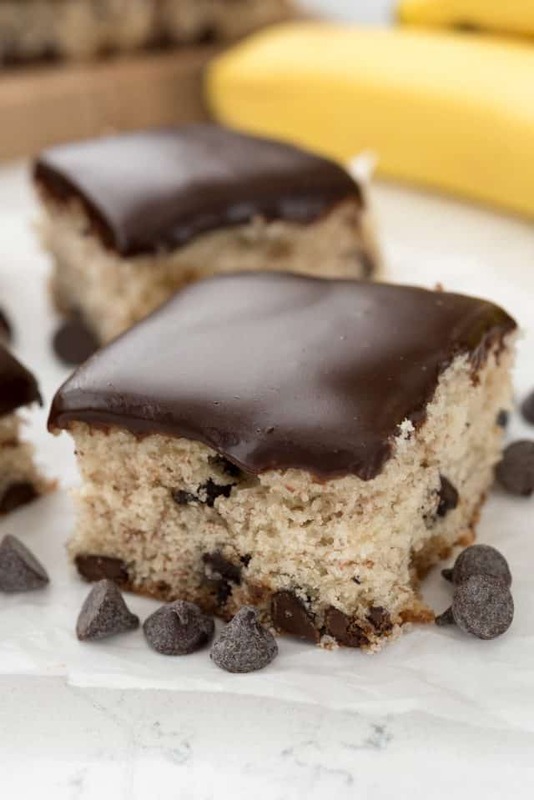 I had no idea that bananas could turn cookie dough into cake! This is such a pretty, easy dessert (icing and all)! I am always looking for new ways to use bananas when we suddenly find ourselves with more ripe bananas than we can eat before the fruit flies invade! Question, Dorothy: I would like to make this for a friend today and Target only had chocolate chip dough in a roll. I am going to give it a try and leave out the added in chips (they are already in the dough). I just want to make sure that the 30 ounce size is correct? I have no idea if the refrigerated dough comes in different sizes. Thanks!! So, you’re telling me that this is a cookie, blondie and cake in one and that too with just 4 ingredients!? G.E.N.I.U.S!